Azzy has found his forever home! Azzy is an Olde English Bulldogge! 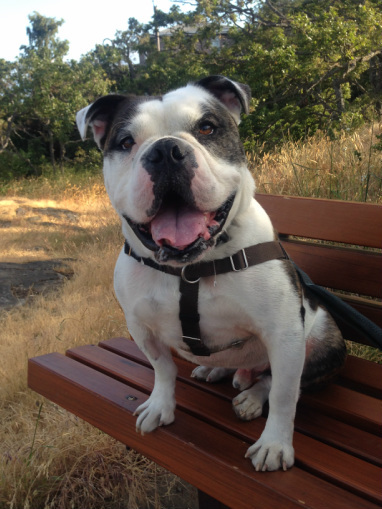 Azzy is a 3 yrs old Olde English Bulldogge and will be turning 4 in November and is looking for his forever home. Azzy was neutered as a puppy, is has just been micro-chipped and full-vaccinated for his new home. At a nice solid 64 pounds with great legs he's ready to walk and jog and sometimes run but not for very long. Azzy is a smart guy and loves to work for cookies he already knows some basic commands like, sit, down, shake a paw and stay and wait and roll over. Azzy loves to carry his favourite toy around which is a stuffed white abominable snowman. All other stuff animals get destroyed nothing is as good as his abominable snowman, he is happy to chew on a bone and play fetch.. well sometimes he likes to just chase the ball and not always bring it back. Azzy loves going for car rides and hikes. Azzy is not a complete couch potato but can be after some good activity he's happy to lounge around with you. Also he loves to bark to let you know people are at the door or coming near the front door so you also don't need a door bell. He gets along fine with some dogs, and is used to going on group dog walks he rather ignore dogs but gets along well. Azzy wants a home without cats. He doesn't care for some skateboards I think he failed at being the bulldog that could skateboard now they are enemies, yet he is working in being social with them. Azzy loves to be included in all family activities, he might be too much for small kids as he has never lived with small children so no kids under 16. He is in great health with the regular seasonal allergies so he's on a particular food that works for him plus the occasional need for antihistamines so please factor this in to ongoing medical costs. Check out Azzy's Photo Album below more to come shortly!